A harmonious and seamless balance of textures, design, functionality and the finest craftsmanship for a sophisticated and understated sense of home: the new Bottega Veneta Home Collection which will be presented during Salone del Mobile in Milan embraces the warmth and beauty of the highest quality materials meticulously crafted to meld into a timeless yet innovative design. Refined suedes and leathers, bold, strong and contrasting travertine, bronze and oak, marble and silver as well as delicate bone fine porcelain are now presented with this new line against the quietly elegant backdrop of Palazzo Gallarati Scotti, an 18th century palazzo in Via Borgospesso in the heart of Milan which houses the Bottega Veneta Home boutique. The Home Collection has organically evolved from Tomas Maier’s first design, a single bench which he created alongside Bottega Veneta’s skilled artisans in 2006. Since then the house has developed the home design and presented full collections of furniture and home accessories, for some of which Bottega Veneta has collaborated with esteemed manufacturers who hold precious expertise and know-how, such as Murano artisans for glassware and Koenigliche Porzellan-Manufaktur Berlin for porcelain, and Poltrona Frau for seating. Bottega Veneta now holds a dedicated furniture Atelier in Vicenza, in the Veneto region of Italy where it is from. 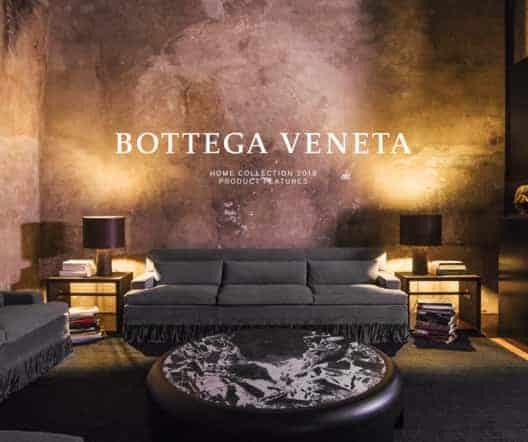 NEED MORE BOTTEGA VENETA HOME INFORMATION ?